When you think of Iceland, you immediately picture snow covered lands and low temperatures. But there's so much more to Iceland, than what you'd think. That's what I realised when I went at the start of January.New Year rolled round, and as everyone went back to work, we packed our bags (after frantically trying to find some practical boots...) and headed in search of this intriguing yet beautiful country. And beautiful it was. 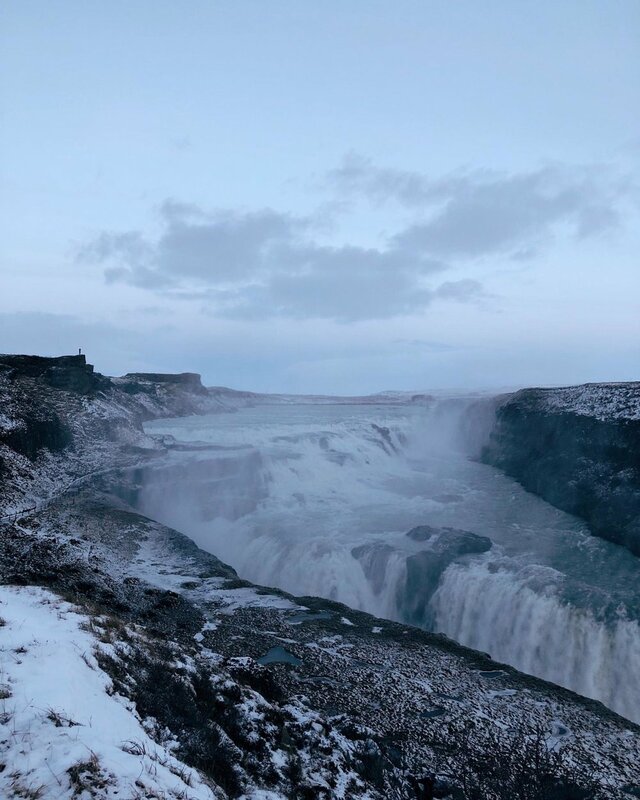 Actually, there aren't enough words to describe this place.It is magical.So magical, that here are my seven reasons on why Iceland should be on your bucket list. Up the top too. I was a little sceptical about the tour as I'm not one to book those kind of tours. But as soon as we arrived at the bus stop at 7.30am, and spotted all the crowds, I realised how common this trip was. We'd booked onto the Golden Circle and Langjökull Snowmobiling tour however there are so many different ones to do. After being picked up early, our first stop was Þingvellir National Park, which is one of Iceland's most historic and beautiful spots. As we visited in January and arrived at the park at 9am, it was pitch black still. Our eyes managed to adjust slightly, but even in the winter light, it was incredibly breathtaking. Games of Thrones also shot a lot of scenes here, and it's so understandable why! After a tour of the park, we headed towards Geysir Springs, which is also another incredible sight to see. The guide explained the temperatures, and mentioned how people are always tempted to touch the water JUST TO BE SURE the guides are right. There's nothing not high-temperature about these springs, and I loved watching the contrast of the springs spouting with snowy mountains on the horizon. Here, we then separated to experience the second largest Glacier in Iceland, before heading back and enjoying a stop at the Gulfoss Waterfall. The starts are early, the drive is long, but the day is completely worth it! What an experience this was! I'd booked this for my dad's 60th birthday present, and I don't know who enjoyed it the most. 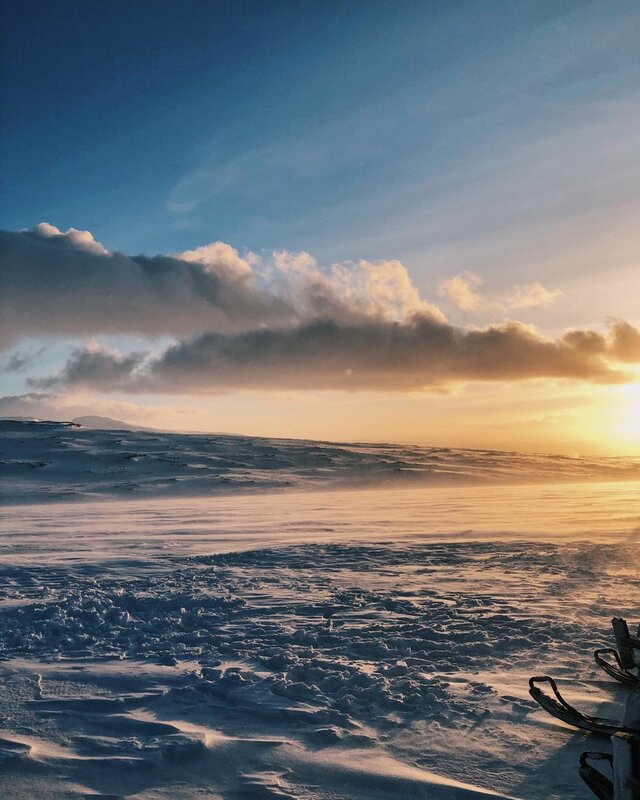 As part of the Golden Circle Tour, you can either have half of the tour exploring the waterfalls and other experiences, or like us, opt for the Golden Circle and Langjökull Snowmobiling tour. Here, Mountaineers of Iceland greeted us, in their super jeep (and I mean SUPER - check my Instagram Highlights for that one) and drove us towards the Glacier which took roughly 45 minutes. The views on this drive were absolutely unbelievable at every single turn we took on the road, and I could have easily driven for much longer. Arriving at a hut, we were given appropriate warm clothing to add over the top of ours, including a helmet and gloves, and then we headed back onto the jeep to be taken higher up to the snowmobiles. In the middle of nowhere, we learnt briefly how to use the snowmobiles, before getting on them and heading out! There were simply not enough words to describe the snowmobiles, the glacier, and the whole experience but wow. There were stops for photo opportunities, views to admire, endless mountains to take in, and just feeling incredible love for this beautiful country. Even though it'll only feel like you've been riding for five minutes, it will be one of those moments you'll never forget. We debated the Blue Lagoon weeks before our trip (maybe even months), but we just weren't sure if we really wanted to do it, especially considering the price tag (it was £79pp). As we'd had a bit of a timing issue on our first day, we put back our Golden Circle trip to the following day, so had some free time to really mull it over. Realising that we wouldn't be coming back to Iceland anytime soon, we couldn't NOT visit the Blue Lagoon, so paid the £79 each AND the transport fee (ouch), and went in search of a bikini (thank you H&M) and headed to Blue Lagoon. Our time was actually booked for 6pm (you need to factor the 50 minute transport) which meant bathing in the dark, but with lights dotted all around the lagoon, it really didn't matter. It was raining, and it was cold on land, but as soon as your shoulders are under that hot water and enjoying a drink from the bar, the rain or cold doesn't bother you, and here you'll really realise just what an amazing country Iceland is. Screw the price tag, this is worth the cost! I think, even if you had no trips planned, admiring just the landscape is more than enough. And there's so much of it to admire! We obviously went in Winter, and although the daylight is limited (sunrise happened about 11.15am and sunset was about 3.50pm), it's absolutely gorgeous - maybe the best time to visit? The snow filled mountains, the chance to see the Northern Lights, and less people around makes this such a calm and magical time to visit. I am however very tempted to visit in Summer, purely for the midnight sun and those green landscapes too. Oh, and rent a car - you'll see MUCH more of the landscape and country this way, with the chance to pull over any time you want to explore somewhere! It's completely understandable why so many people fall in love with this country. The city alone is worth coming to visit, because it's so quaint, so friendly, and so colourful. The city might be small in size, but you're never short of places to eat and drink here either, with some cosy bars and coffee shops and restaurants on every corner. We walked a lot of the city, which was a great way to see everything, especially as we love wandering down all the streets full of colourful houses, however my parents actually tried the Hop On Hop Off bus - and even though the reviews online were all very negative, they personally said it was a great way to see a lot of the city, for those less able to walk it all. We'd recommend visiting Hallgrímskirkja, the church for views over the city and beautiful architecture, and taking a wander down to the water for a perfect picture opportunity! So, we might not have seen them, but honestly, what a night that was! We'd booked via Trips, who picked us up in a minibus along with 12 other people, and were introduced to our driver/tour guide for the evening. And what a character he was! His words to us which summed up our tour were "basically we shall drive around for a little bit, and just hope that we see something'. And sure enough, that's exactly what we did! The two nights prior, Northern Light tours had been cancelled due to the weather conditions, so we were lucky that ours hadn't been, but each tour guide will always keep you updated on weather conditions, which is really helpful. For the best chance to see the Northern Lights, you have to head away from the city, and I realised later that we'd actually gone back towards Þingvellir National Park where there's some great opportunity for them. The good thing about booking with Trips, was that our driver didn't rush us back to our hotels come 11pm, and instead carried on driving us around until at 12.30pm, until we all agreed that our chance of seeing them, wasn't meant to be. Regardless of what we did or didn't see, it was definitely fun! Oh there really are some amazing places to eat, and actually, I wish we'd had longer so we could have eaten more! The night we arrived in Reykjavik, we headed to Forréttabarinn which was close to where we stayed. It's a stylish restaurant, and very popular among the locals. We ordered from their 4 Course Set Menu, and you won't be disappointed. The portions are huge and the flavours are incredible, and the wine was perfect! The second night, we ate really late after visiting Blue Lagoon, so ordered burgers from Le Kock, which was in Exeter Hotels where we stayed. I'm so glad we got to try these, as they were delicious - and their fried potatoes are seriously something else! My parents ate in the Sweet Pig that night, and said they'd recommend here too. We also managed to try some Danish Smørrebrød at Jómfrúin, so would suggest two dishes each. We also had lunches in The Coocoo's Nest which is in the old harbour, and has amazing interiors, and got to try the soup in bread at Svarta Kaffid (they don't have a menu, purely serving a meat and vegetarian soup - which changes regularly). And finally, I'd recommend visiting Braud & Co, for a heavenly cinnamon roll, Reykjavik Roasters for some coffee and quirky interiors, and also Grandi Mathöll, a cool street food hall in the old harbour too.And that, is seven reasons why you should visit Iceland! It's such an incredible and magical country.